Google has launched a re-imagined version of its free Earth mapping service, weaving in storytelling and artificial intelligence and freeing it from apps. “This is our gift to the world,” Google Earth director Rebecca Moore said while giving AFP an early look at the new version of the programme that lets people range the planet from the comfort of their computers, smartphones or tablets. A new ‘Voyager’ feature enables people digitally exploring the planet to be guided on interactive stories told by experts, boasting partners including BBC Earth, NASA, Sesame Street, and the Jane Goodall Institute. Google artificial intelligence will be put to work for Earth users in the form of “knowledge cards” that let them dive deeper into online information about mountains, countries, landmarks or other places being virtually visited. It will also make suggestions on other locations armchair explorers might be interested in exploring based on what they have searched in the past. “This is the first time we have done this deep integration with the Google Knowledge Graph,” Earth engineering manager Sean Askay said. There is also a newly installed “Feeling Lucky?” feature for people who want to let the software suggest hidden gems such as Pemba Island off the Swahili coast or the Oodaira Hot Spring in Yamagata, Japan. People can choose to fly around the world in Earth, using a 3—D button to see the Grand Canyon, Chateau Loire Valley and other stunning spots from any angles they wish. “With the new Earth, we want to open up different lenses for you to see the world and learn a bit about how it all fits together; to open your mind with new stories while giving you a new perspective on the locations and experiences you cherish,” Earth product manager Gopal Shah said in a blog post. Online explorers cruising the mobile version of Earth can also capture pictures on their travels, sending friends digital postcards. 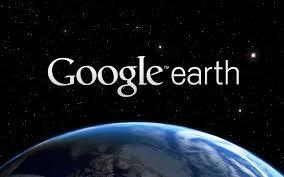 New Earth was launched on Google’s Chrome and Android software, with versions tailored for Apple devices and other internet browsing software promised soon. It’s the first time that Earth can be reached on a web browser instead of through applications installed on devices. The move allows Google to tap into more powerful computing power at data centers in the internet “cloud” instead of relying on the capabilities of smartphones and other devices.